Here’s to an Eek-O-Friendly Halloween Full of Savings! If you have been hanging out here at Environmental Booty for any time at all, you know how much I love to help consumers live greener lifestyles and save money while doing it right? Well it's time to get ready for an eek-o-friendly Halloween celebration to save some money - and our planet. Here's how to green your Halloween and save money and our landfills with National Costume Swap Day®. 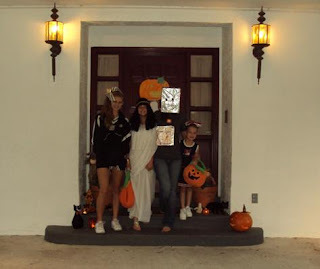 I bet you had no idea that, according to the group Green Halloween®, if half the kids in the U.S. who celebrate Halloween swapped costumes, rather than buying new ones, our nation's annual landfill waste would be reduced by 6,250 tons. That's almost the equivalent of the weight of 2,500 mid-size cars. Kind of amazing when you think of it in those terms huh? Isn't it incredible that a simple thing like swapping costumes instead of tossing them creates a healthier, more sustainable world for us all? We can't do it alone, but we can do it together. You know, I think moms have been greening Halloween for years and just didn't know it right? Haven't you swapped a costume with a friend or reused a costume to save money? I certainly reuse my daughter's old costumes and have swapped with friends. It really is that easy to save money and live green at the same time. And thanks to National Costume Swap Day on October 8th, this year families will be joining together throughout the US to green their Halloween. A few of my green friends have joined forces to help you and your community have an Eek-o-friendly Halloween costume Swap on October 8th. Green Halloween, Swap.com and Kiwi Magazine have joined forces to help you host a swap for your friends or even your entire community. How cool is that? They will even help you get the word out by allowing you to register your Green Halloween Swap on their site. Registering a swap is not only a way to let your community know you're hosting a Swap, but it's also a great way to spread the word to local and national media. A costume swap is the perfect, eco-friendly, fall activity to bring a community together and of course, in these challenging economic times, it will also save families money. Plus, there is absolutely no fee to add a Swap to the National Costume Swap website and you can easily find a Swap in your area if you aren't able to host a green costume Swap this year. New Swaps will be added right up until Halloween Day!